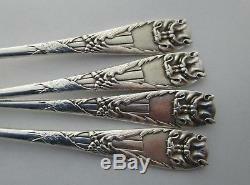 Offered for sale is (4) Four Rare Asethetic, Sterling Oyster/Cocktail Forks in the unusual and scarce pattern called "Number 3 " manufactured by the Gorham Co. (pattern also called Bat or Gargoyal). 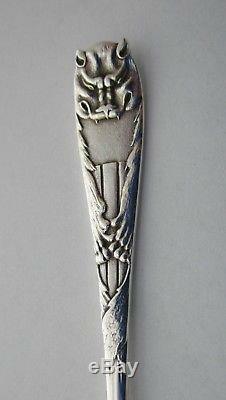 The front of the forks handle has the Head of a "Bat" on the top with the Bat's wings and claws folded on the handle. The Bat's wings wrap around to the back side of the forks handle. (see pictures for close ups). The forks are approximately 5 7/8 in length. There is a set of three script letters monogram on the back of the forks handle which is very fancy. The back of the fork handles also has the manufacturers hallmark, the word sterling and the pattern number 3. The forks are in very good, used antique condition with No damage or repairs. We have a number of early unusual pattern Pie Servers, Serving Spoons, Butter knives, fruit knives and Cheese knives for sale in our store please take a look. They make wonderful and unusual gifts! Thirty day unconditional return privilege. 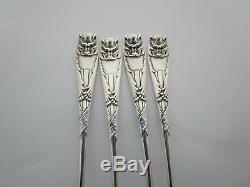 The item "Set of (4) Four Rare Astectic Sterling Silver Gorham Bat Oyster Forks C 1885" is in sale since Saturday, October 7, 2017. This item is in the category "Antiques\Silver\Sterling Silver (. The seller is "allstan" and is located in Enfield, Connecticut. This item can be shipped to United States, Canada, United Kingdom, Australia, Japan, Ireland, New Zealand.